Here at OHBI we're all about simple outfits. Some may even say we're basic in more ways than one. We love everything pineapple, use abbreviations when it's not necessary, and although we're not the biggest fans of pumpkin spice lattes we still enjoy all those pumpkin scented candles from Bath & Body Works when Fall rolls around. We don't mind being classified as basic because we know how to add those details that take a simple outfit to the next level. For our looks this week we decided on a classic black top and light denim combo. If you have only two items in your closet it should be a solid pair of denim and a basic black top. These two items can be worn for any occasion from lunch with your BFF to a night out on the town. We want to share a few of our favorite effortless ways to add your personal style to any basic OOTD. Ankle booties, accessories, and embellished pieces are just a few of our little secrets! Our favorite black booties are a staple for any basic outfit. S showed her edgier side by choosing ankle booties with silver eyelets and a slit. This non-existent heel is functional and fashionable for any adventure. Wear these booties with some no-show socks to keep your feet fresh in the summer heat! Statement necklaces are a super easy way to add some flair to your outfit. A chose a vintage gold spiked necklace that matched perfectly with her Gold Floral Design Maria Shireen bracelet. This basic crew neck cropped tee made these accessories pop! A few dreamy accessories will take any outfit to the next level. Try it out friends! We're suckers for tops with unique details! S couldn't resist this black cinched waist top! We won't lie it felt a little bit like wearing a corset but what's a little pain in the name of style. The eyelet details on this top paired perfectly with the edgy booties and tied this outfit together. Every gal loves a good handbag or backpack. For this fit we used our floral backpack again. The perfect bag for any adventure (basic or not) especially because it's big enough to hold all the things you'll never use. We're guilty! If you want to prevent yourself from over packing opt for a black clutch and add your flair! We're talking actual FLAIR. Pins and patches are one of our favorite ways to tell the world a bit about ourselves. Here we're telling the world exactly how fun we are by stating the fact " I am fun". Thanks Ban.do for the constant affirmations. We partnered with Maria Shireen to highlight the beautiful floral design bracelet. This elegant bracelet is the perfect addition to any basic outfit. We don't normally strut around with pretty bouquets but these bracelets gave us all the floral vibes! Don't worry, you can opt out of the fresh flowers for one of these dreamy bracelets instead. These bracelets really are the bees knees y'all! However you choose to add your personal touch to your basic outfit know that it will be anything but basic because you're a magical one of a kind unicorn. 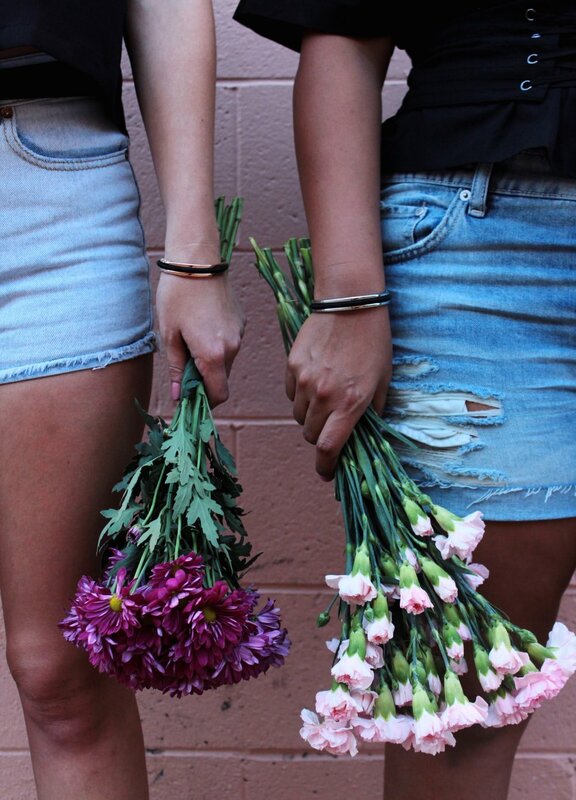 Grab your bestie and some fresh flowers and hit the town in your favorite non-basic outfit! BOOP! 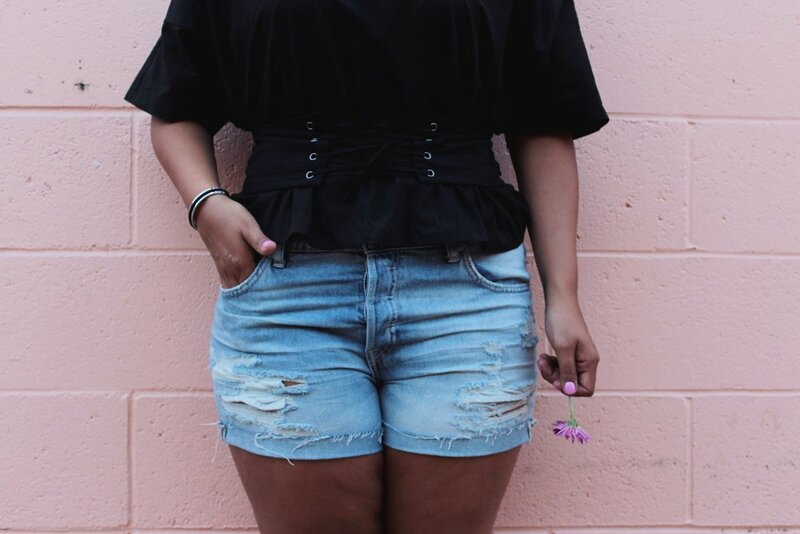 Tag all of your inspired fits on Instagram with #OHBIgirlgang! We can't wait to see what you share with us.